Since I don’t photograph pink polishes often, I didn’t realize that this shade would morph so much on me. In dim lighting, it looked completely different than what you see in real life. With flash, it’s closer, but not accurate. And I wasn’t able to get any photos of me wearing it when the sun came out. So, why even bother showing you this if the colour in my photos isn’t accurate? You can see the finish and get an idea of the opacity. Plus I’m learning as I go. I’d like people to see my improvement over time. 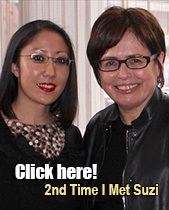 I don’t want to be a blogger who only shows photos when they come out as expected. That’s not real life. My nails are an open book to all of you! 😉 Some chapters will be better than others. No name on the bottle anywhere, so if you get the mini set, keep the box! Natural Light – Haha, I tried colour correcting, but my skin ended up looking deathly! It’s a fun, girly pink that is very Barbie-esque. It has a bit of a bite to it because it’s not anaemic like a pastel pink, but it’s not as loud as a neon pink, either. Sometimes under artificial yellow light, I noticed that it looked like it had a hint of reddish orange. But most times, it looks like a deeper bubblegum pink. Note: It is not purplish or fuchsia in any way like some of the photos above would suggest. 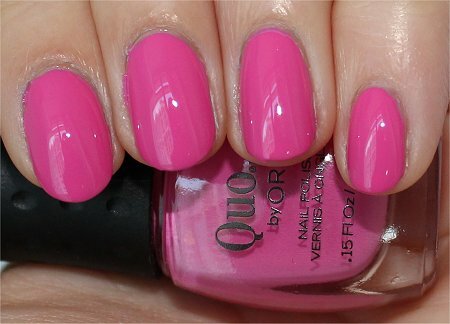 Edit: Check out the Pink & Black Konadicure I did with Quo by Orly True Love here! All this being said, I felt good about trying another pink. (As many of you know, I’m on the quest to find pinks that work for me. Most pinks look horrible on my skin tone.) 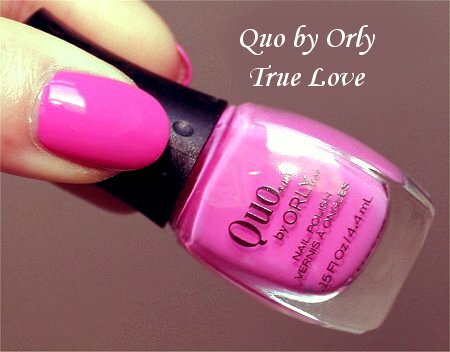 Quo by Orly True Love doesn’t seem to clash, and it looks alright. It just doesn’t wow me. But this is one step in the right direction! Quo by Orly True Love is a creme polish, so this means it’s really easy to remove. No scrubbing like you would to get a glitter off! This definitely needs at least 2 coats. Even though the mini bottle came with a super small brush, I found it very easy to manipulate because, well, my hands (and therefore fingers) are small. Those who have larger nail beds may find that they need to keep re-dipping the brush into the polish to get more. And for them, I’d recommend just getting the full-size bottle with the regular-sized brush. True Love didn’t win my heart over. There’s nothing wrong with the colour, but I feel like it’s not my pink soulmate. I’m still on the hunt for one that pulls my heartstrings. This, however, at least didn’t clash with my skintone. 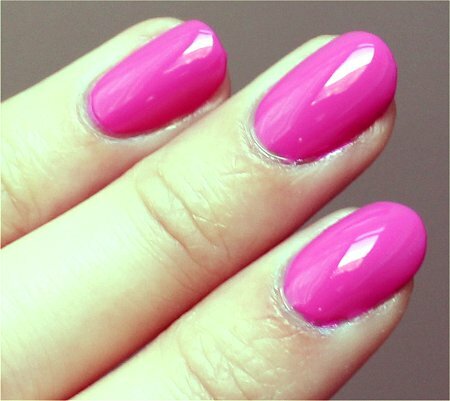 Do you wear pink nail polish often? Which brand do you think makes the best pink polishes? Have you found your true love? 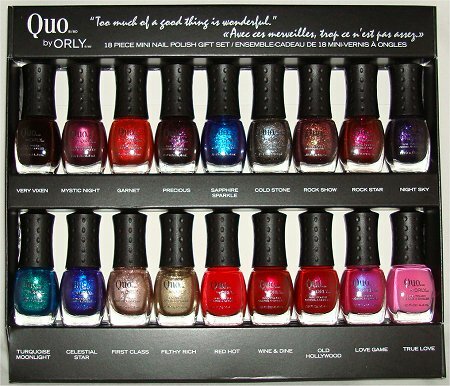 This entry was posted in Nail Polish Swatches & Reviews, Product Reviews and tagged Quo by Orly on January 4, 2012 by Mary S.. I love your short nails, the length is perfect. The pink is pretty but is a common bubble gum pink. Even though my tastes run to murky greens, black, and purples, I’ve got tons of pinks from the cooler end of the spectrum, as well. Sometimes, I’m just in a pink mood. It’s strange, but I usually never get in a pink mood. But it’s all because I haven’t found the right one. Good to know that this one is a step in the right direction. I want to find a shade like this, but lighter that I can wear…since I haven’t found one yet that looks okay. Good point – I think if I had kept my nails really long and worn this shade, it would look tacky. Oh I love pinks! This set looks great too since I also love minis. I get bored of one colour quickly so 18 would have kept me happy for a while! The set is awesome – lots to choose from. And after Christmas, the set went on sale for even cheaper than I bought it. It’s a good deal, and I can see people buying it if they want to split the colours with their friends. The color looks amazing on you. The only thing different between you and me about nail polish is that I love pinks. I like this shade of pink even though it’s common. 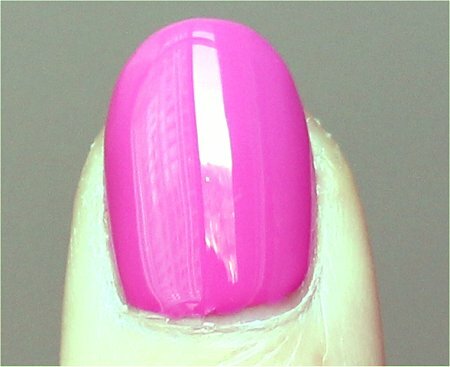 Okay, I don’t hate pink polish – I just find most them hard to pull off. I’m glad you finally found a pink that doesn’t war with your skintone! It really does look great on you and I think it’s a nice change from your usual rotation. 😀 Have you tried Nicole by OPI City Pretty Rose? It’s one of my absolute fave pinks and it looks like a it might be a deeper version of this. Keep looking! I remember shortly after Christmas, Shoppers heavily discounted this set. In one of their flyers, they showed a picture of it and advertised it being up to 50% off! (Of course the keywords are “up to”, but still! Good deal on a great set!) Hope you can find it. If I see it on sale, I can pick it up for you if you want. Just let me know. No, I haven’t tried City Pretty Rose before. Deeper pinks and neon pinks, I usually don’t have trouble with. It’s the lighter pinks that do funny things to my skin tone. Sometimes they make my skin look red like a lobster, and other times, they make me look like an alien mutant. Aww…Carmela, you know I missed ya! 🙂 It’s good that you’ve been busy! 🙂 Are you feeling alright? How’s your husband? I like this collection a lot! The colors are so vibrant. Also I’m loving the short nails. They look great! I’ve got little nubs too haha my nails just refuse to stay long. Rock those short nails! 🙂 Little nubs are so chic and sometimes prevent flashy or bright colours from looking tacky. I wish more people would appreciate short nails as much as long nails. Hehe, our nail-polish hearts beat as one. Purples, blues, and greens are my favourites, too! Pink use to be my favorite color when I was younger and it’s still a color I like, but I’m not in love with it anymore. So this polish doesn’t really do that much for me. I don’t have many pinks in my collection, but the color that got me seriously into nail polish was China Glaze Naked which is pink. Out of all of the colors I had the choice to get that day, that’s the one I got. That was two years ago and even then I really didn’t go crazy with pink or even red polishes. I sort of went straight to liking those bright, unique colors, and dark, vampy ones. China Glaze Naked and OPI Sparrow Me The Drama are really the only actual pink polishes I own. I do want to add OPI Pink Friday to my collection though. 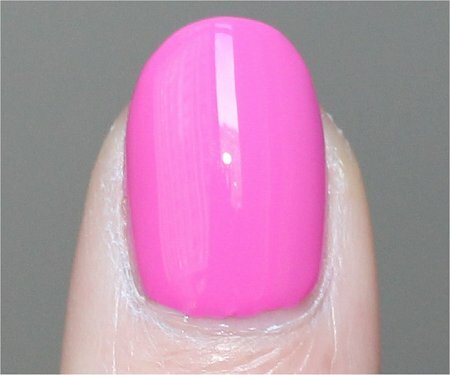 I haven’t seen many bubblegum/eraser shades, so I’d love to try it. I’ve been on the fence about OPI Pink Friday. I think it might work just by looking at it in the bottle, but…judging from my past history of trying out lighter pinks, I’m not very good at picking them. Still, it looks pretty. Hey Mary, you should wear more pink, it’s nice. and this one particularly is a nice shade, kinda like a bubblegum shade. If I can find pinks that suit my skintone, I’ll definitely wear them more. You’re wearing pink! I can’t believe it. Are these someone else’s nails?? Haha. I never got around to buying that quo set that you posted up a while back. I really wanted it, but somehow along the way I forgot about it. Probably because of all the new winter polishes that were released around the same time. It’s good to experiment but don’t worry I think the photos look great. I find that I can wear peachy, dusty pinks better than bright colors like this one. Have you tried something like China glaze IV? If you still like the set even just a little, it’s worth hunting down now. I saw it in the flyer not long after Christmas, and they advertised it, along with other Quo gift sets, for up to 50% off! That would be a steal! Nope, I’ve never tried China Glaze IV. Don’t even have it. That colours nice. Wonder if it’ll be flattering…Only one way to tell! Like you, I usually shy far away from pink. I just don’t find it as interesting as blues, greens and purples. However, after wearing a ton of darker colors, I’m actually sporting a pink manicure as we speak! As for recommendations, my friend has bought and adored CG’s Strawberry Fields and OPI Rally Pretty Pink. Her love for them has almost convinced me to get them for myself! Oh yes, I love those two pinks! I find pink cremes harder to pull off than if there’s glass-fleck or foil-shimmer. I don’t care much for pink (although surprisingly I do love my Pink Friday polish! I guess it’s just cuz of Nicki Minaj, haha) but what really stands out to me about this polish is how shiny it is!! Gosh, it looks like you just covered your nails in cuticle oil and took the picture! That polish with SV is the shiniest thing I’ve ever seen! Talk about wet-look! It sounds similar to Pink Friday, only much shiner and Pink Friday doesn’t have any orange tinge to it in any light, it does sound similar though in the way that it’s sort of neon only not, and definitely not pastel. If I had to choose a pink, I’d choose something like this and Pink Friday. Have you tried PF or any of the other Nicki Minaj collection polishes? It was indeed really shiny, and of course my top coat took it to the next level. 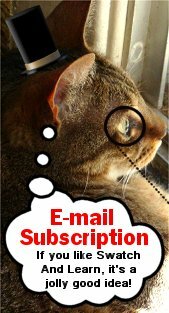 Hehe, you’re right – when I looked again at some of those photos, it DOES look like there’s cuticle oil…even though I never use that (but probably should)! No, I haven’t bought any of the colours in the Nicki Minaj Collection, but I have my eye on Save Me! I think part of the fun in owning so many colours (especially if you’re like me and like to obsessively compulsively match clothing to polish) is that you – via your nails- can take on a different personality while sporting the colour. Now I’m not saying be Barbie, have a few lemonades with Ken and stiffly walk over to your Barbie mobile home (thought… who knows,… lol). 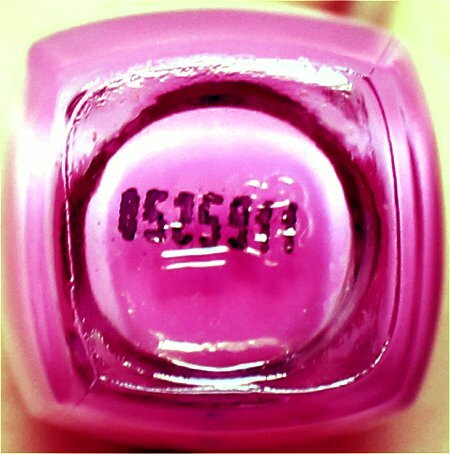 Haha, I should’ve stamped “Made you look twice” on my nails – one word per nail from index to pinkie. Thanks for always leaving comments that bring a smile to my face! I love this colour, I’m partial to a purple or pink! Hmm…maybe you can recommend some pale creme pinks that you think would work with my skin tone?